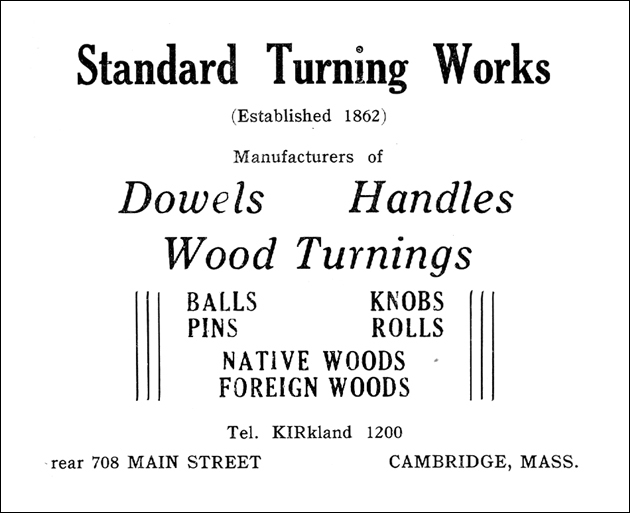 Established in Boston in 1862 by F. Geldowsky, The Standard Turning Works specialized in the manufacture of furniture and turnings in ivory and wood. The company was moved to Cambridge in 1864 and quickly became a well-known producer of furniture. By 1877, control of the company was transferred to P. Keeler & Son and production was moved to a larger factory in the area enclosed by First, Second, Otis, and Thorndike Streets. By 1884, a retail store for the firm was opened in Boston. Although the firm only employed fifteen workers by the early twentieth century, its products were in demand and exported to both national and international locations (Gilman, 1896; Stone, 1930).